C.J. 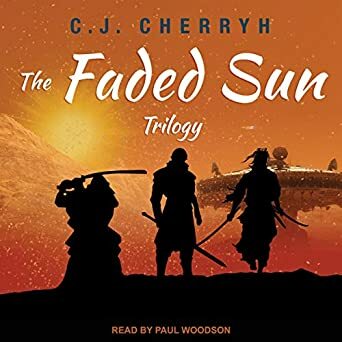 Cherryh’s FADED SUN trilogy (1978) consists of three books: Kesrith, Shon’jir, and Kutath. They’ve been bundled into an omnibus edition and Tantor Media sent me a review copy of their recently released audiobook version. The three novels make up a continuous story of clashing civilizations that takes place in the far future with a few alien species on several distant planets. One of these species is the Mri, a race of excellent fighters who hire themselves out as mercenaries to other races. For two thousand years they have been acting as the military arm of a more technologically-advanced and power-hungry race called the Regul. The Regul are not suited to combat because they become heavy and immobile as they age, so they’ve hired the Mri to fight in their war against humans. After decades, the Mri have been nearly wiped out (thanks to Regul ambition), and when the humans finally win the war and arrive to claim the gateway planet of Kesrith, which they have won from the Regul, the Regul become afraid of their Mri mercenaries (who they betrayed) and attack the Mri base, killing all but two of them. An ethically-minded human man named Sten Duncan decides to help these two Mri (perhaps the last of their species in the universe) find their holy relic and escape Kesrith so they can attempt to locate their home planet (a place they left generations ago) and see if any of their species are still alive under its fading sun. If there’s anyone left, they will try to inspire and train them for the purpose of getting revenge. During the tumultuous journey, they will experience many hardships. The chance for success is small, but there’s nothing left to lose. However, if he accompanies them, Sten Duncan stands to lose everything. Even his humanity. But Duncan realizes that these three civilizations do not understand each other at all and he hopes that he can help. One of Cherryh’s alien species (the Mri) has a matriarchal society. That’s refreshing (but not unheard of) for an SF story written in the 1970s. The Mri also have very strict codes that dictate nearly every aspect of their behavior. When their environment changes, they have trouble adapting, which threatens their survival even further. Cherryh’s style is formal, ponderous, detached, and dark. This is a grim story with few moments of lightness. There is no humor or romance to relieve the despair, though there are some touching friendships that develop between different species, including an interesting animal species. The relentless bleakness suits the tale (it’s about genocide, after all) but, for me, it was a bit exhausting, especially because the story moves so slowly. Readers who love being immersed in a long drawn out fantasy epic should give THE FADED SUN a try. Those who become impatient with a grim and slow-moving plot will probably not appreciate the trilogy as much. The audiobook, which is brilliantly narrated by Paul Woodson, is 30.5 hours long. Originally published in 1978. Audiobook published in December 2018. 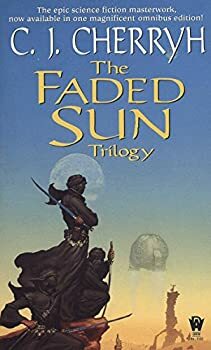 All three books in C. J. Cherryh’s epic The Faded Sun trilogy – Kesrith, Shon’jir, and Kutath – collected in one volume. They were the mri-tall, secretive, bound by honor and the rigid dictates of their society. For aeons, this golden-skinned, golden-eyed race had provided the universe mercenary soldiers of almost unimaginable ability. But now the mri have faced an enemy unlike any other – an enemy whose only way of war is widespread destruction. These “humans” are mass fighters, creatures of the herb, and the mri have been slaughtered like animals. Now, in the aftermath of war, the mri face extinction. It will be up to three individuals to save whatever remains of this devastated race: a warrior – one of the last survivors of his kind; a priestess of this honorable people; and a lone human – a man sworn to aid the enemy of his own kind. Can they retrace the galaxy-wide path of this nomadic race back through millennia to reclaim the ancient world that first gave them life? Like Bill, I loved these. I have always admired how genuinely alien her aliens were, how difficult communication was, and how easily things could go wrong, even when both parties were communicating honestly by their lights.